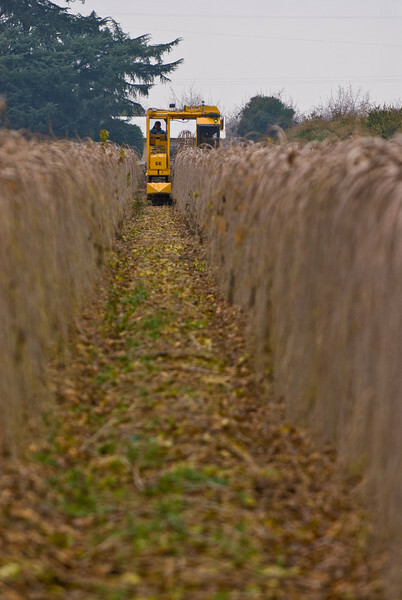 These photo galleries show tree harvesting operations from the L.E. Cooke Co Wholesale Nursery www.lecooke.com. They specialize in deciduous trees (trees that go dormant) for the home and commercial landscapes and gardens. Fruit trees, shade trees, ornamental trees and shrubs, flowering trees, grapevines, berries,etc. For more information go to the L.E. Cooke website at www.lecooke.com. If you want a photo, select the photo, click on “buy this photo” then select “Downloads”. There is a nominal cost for the file to support this website. GK Tree Digger harvesting Teas Fruiting Weeping Mulberries (Morus alba 'Pendula') at L.E. Cooke Co Wholesale Nursery.